Slate roofing is a classic roofing option popular for most residential homes. It’s among the most durable roofs available with one of the longer life spans of any roofing material. Despite all these benefits, slate is time-consuming to install because it requires specialized equipment and procedures. 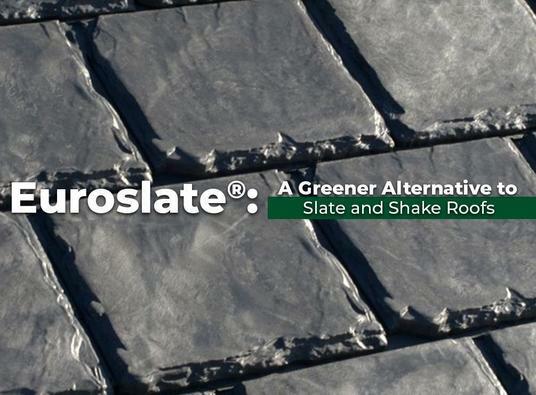 At State Roofing, we offer Euroslate®, a greener alternative for those who love the beauty of real slate minus the environmental drawbacks. Here’s a brief look at it. Euroslate is made from 95% recycled materials, primarily consisting of rubber from recycled tires. This eco-friendly roofing option replicates the architectural style and beauty of the hallmark extra-thick chiseled-edge slate without the hefty upfront cost. In addition, roof maintenance is easier because you or a roofer can walk on it without it cracking, unlike real slate. If you are in need of a roof repair with a real slate roof, it is a maintenance challenge to fix one or a few slate tiles without breaking other slate tiles to get to the ones in need of repair. As your local roofing contractor, we help homeowners take that first big step to becoming eco-friendly. Euroslate, despite being made with recycled materials, has similar physical properties to genuine slate, making it as durable and almost as enduring as the real deal, with a lifespan around 40 to 50 years. This eco-friendly roofing option is actually more weather-tolerant than natural slate as well. Because it’s primarily made from recycled rubber, it has a higher water and moisture tolerance compared with 100% slate, making it the perfect choice for homes that experience a lot of rain and humidity throughout the year. It also resists hail better than real slate. You can choose between three different colors for your new Euroslate roof: the archetypal black and gray or a more contemporary weathered brown. This roofing system’s versatile aesthetic makes it a viable choice for both classic and modern homes. Whatever roof color you pick, count on us to have the special set of skills required to install it properly. State Roofing, your local roofing company, can be contacted at (800) 810-7305. You can also fill out our form to request a free estimate or to learn more about our eco-friendly Euroslate roofing systems. We serve homeowners throughout Tacoma and Kirkland, WA.